The Mill Bay Community League, Who Are We? To answer this question we must step back in time to 1945 when the local community started talking about the need for a public hall. 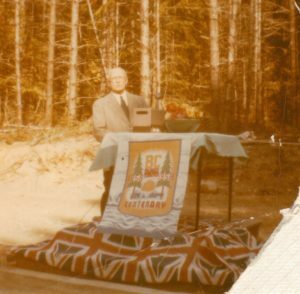 This was a time when many veterans were coming to Mill Bay seeking homes and jobs as loggers, farmers, Bamberton Cement workers or at the Queen Alexandra Solarium located on the present Brentwood College site. In Oct. 1945 a meeting was held at the Masonic Hall and aims of a Community League were outlined, officials elected, a constitution drawn up and the league registered under the Societies Act. Their first objective was to build a hall. In 1948, the owners of the Millstream store (located at what is now Pioneer Centre) offered the league a small building, which had been built by Grant Garnett Sr. as a tea-room and soda shop. Mr. Scollard, whose property is now part of the new Marina development, promised to donate a lot he owned on Deloume Rd and the little building was moved. Although a Heaney’s truck took hours to move it to its new location, they never encountered a single vehicle on the main highway. However Mr. Scollard’s promise of land was not fulfilled so George Frayne offered an acre lot on the Shawnigan-Mill Bay Rd. He suggested the League buy the whole 19 acres for $1600. John Kerry, a retired lawyer living at Deer Lodge, offered to buy the land and sell it to the League for payments of $100 per year. The League women worked hard to raise the $100 payment through various fundraising activities until Mr. Kerry died. In his will he forgave the balance owing. 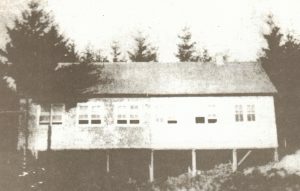 The League now had land but no building so the Loveseth Brothers offered a building built by Frank Copley, located about a mile west on Shawnigan road for $100. 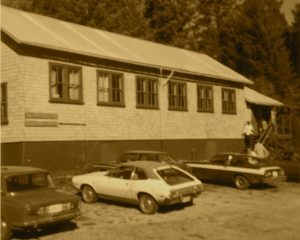 As is the case today the community worked together and with donated materials, equipment and labour the new hall was opened on February 16, 1956. Telegraph lines from the Saanich Peninsula were laid under Saanich Inlet surfacing on this side at Telegraph Rd. The road and lines also connected Cowichan Bay. Harry Good was the first operator.